“5...4...3...2...woah, where are you running away, child?” It’s New Year’s Eve, the end of 2017, and the start of a brand new year. Like all adults, the children also look forward to the joy and happiness surrounding New Year’s Eve. They too like to be part of the New Year countdown as well, and they won’t go down without a fight. So what can you do about it? Eureka. With Netflix New Year’s Eve Countdowns, available from Dec 26th, 12 am PT through Jan 31st, families can celebrate the last ten seconds of 2017 on their own terms. Based on an exciting slate of Netflix original series for kids, this year’s 9 on-demand countdowns let even the youngest members in the household decide when the NYE party begins - whether it’s midnight or not. All Hail King Julien: All you kids, put your dancing shoes on. For your favorite dancing lemur is back to groove and shake with you on this New Year’s Eve. The kids may be familiar with the adventures of King Julien, Mort and Maurice from Madagascar, but this particular outing will take them back in time to enjoy the madcap adventures of King Julien. Happy or sad, Julien sure knows how to dance it out! Skylanders Academy: The greatest perk, perhaps, of being a kid is that they can let their imagination run riot. So, welcome to Skylands kids, where dragons, elves, and many more creatures live together. 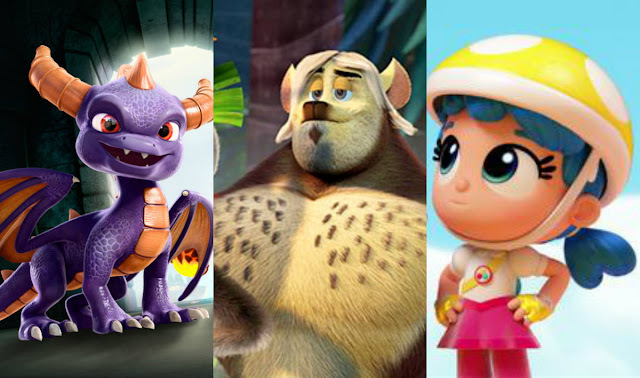 Skylanders Academy has three new graduates - Spyros the Dragon, Stealth Elf and Eruptor. Together these friends will be learning all skills necessary to defeat the evil Kaos, under the tutelage of the masters of the academy. Just wait until you see your child’s face light up when he/ she sees the dragon. Trollhunters: In Jim’s mind, he is just another teenager navigating through life. Lo and behold! For one fine day he uncovered a mysterious amulet that changed the course of his destiny. For he doesn’t discriminate between his world, and that of the troll and becomes a champion for both. For all you know, your child might take up a resolution to be braver this New Year. Beat Bugs: Revolving around five young bugs, this is a perfect entertainer to keep your kid occupied this 31st December. A beautiful combination of fun and learning along with some adventures. And what’s even better is that Beat Bugs features songs from The Beatles. Ding-dong, and sing along the classics. A great way to introduce your kids to the beauty of classic music. True & The Rainbow Kingdom: Take an adventurous ride with True, and Bartleby the cat in the magical world of Rainbow Kingdom. True is the only person with magical abilities to activate the magical powers of The Wishes of the wishing tree. With this power in tow, she shall solve problems in the Rainbow Kingdom, and empower your child with her imagination, mindfulness and empathy. Puffin Rock:Young puffins Oona, and her brother Baba are curious by nature. Residing on Puffin Rock, they are out with their friends to learn about nature, friendship, and family. Larva: Red and Yellow are somewhat slow yet extremely inquisitive worms who love to spend their days investigating. Investigating the otherworldly objects that fall through the grate into their subterranean world. Your kid will love nothing more than joining these two lovable doobs on their quests. Word Party: Perhaps there is only one other thing that can be deemed way cuter than animals themselves. And that’s, ta-da - baby animals! And children sure do dig the sight of baby animal, especially the fluffy ones. Bailey, Franny, Kip, and Lulu love having fun but they become all the happier when they get to learn new things.